The dead bodies of a 59-year-old woman with her 12-year-old son were found yesterday near the village Ferres in Evros area. According to documents found on them, they were from Iran. Another dead body, of a 25-30 year-old man of African origin was found near the village Petrades. On December 22 another dead immigrant was found near village Peplos. 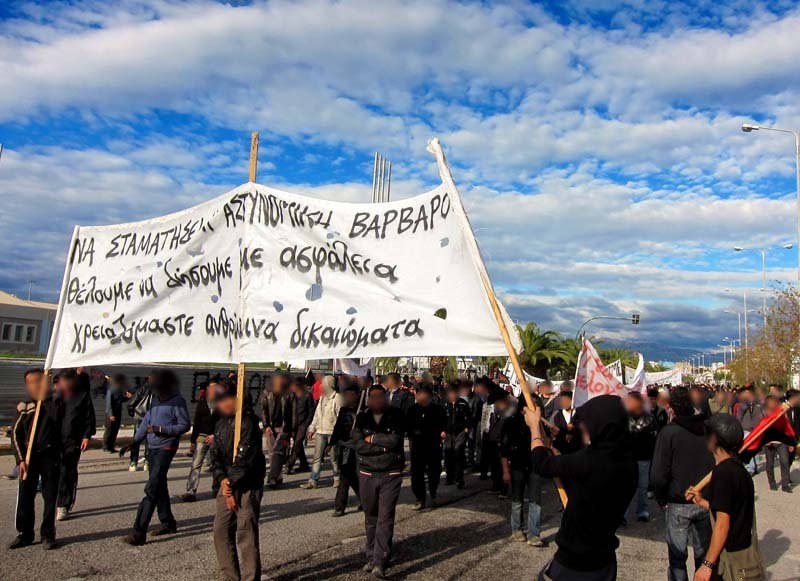 On the morning of Friday December 23, a demonstration was held in the city of Patras. It was organized after a 16-year old Afghan was left severely injured during a police operation in an informal settlement set up by Afghan refugees in the near-by town of Rio. The demonstration started from at the deserted building of Piraiki Patraiki, a former factory, used by Afghan refugees for shelter. 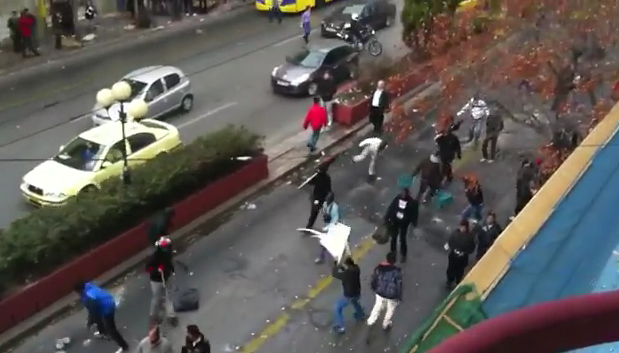 About 400 people, mainly immigrants and people in solidarity participated in a demonstration that lasted 2,5 hours and went through various neighborhoods as well as through the center of Patras, all decorated for christmas. – What about our future and our destiny? 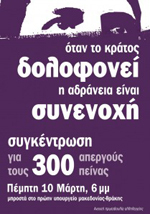 One of the 300 hunger strikers (of the immigrants’ victorious hunger strike between January and March 2011) was deported. The police claims that he had a Schengen warrant pending in Italy. 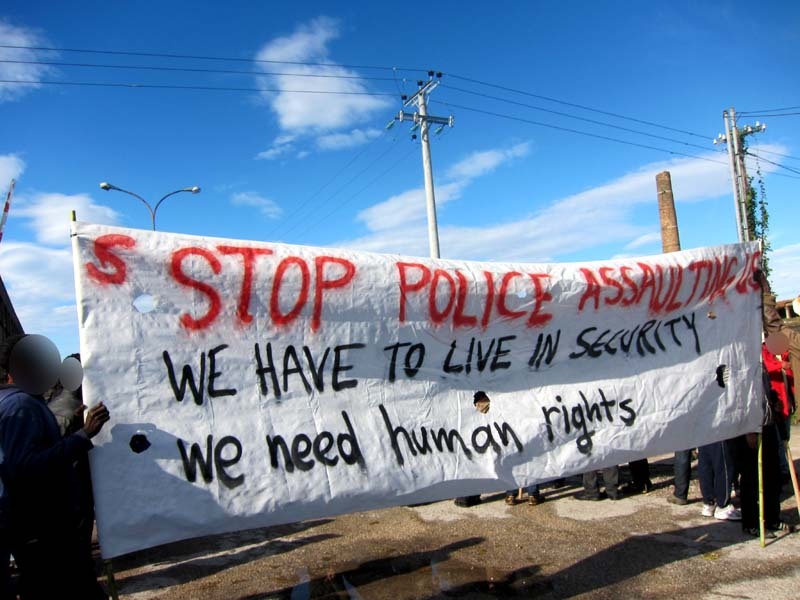 Lawyers and solidarity groups tried to help, but could not prevent the deportation. On December 22 the corpse of a man, probably between 25 and 30 years old, was found near Peplos, in the Greco-Turkish border region of Evros. He died attempting to cross the border by swimming through the river Evros/ Maritza. 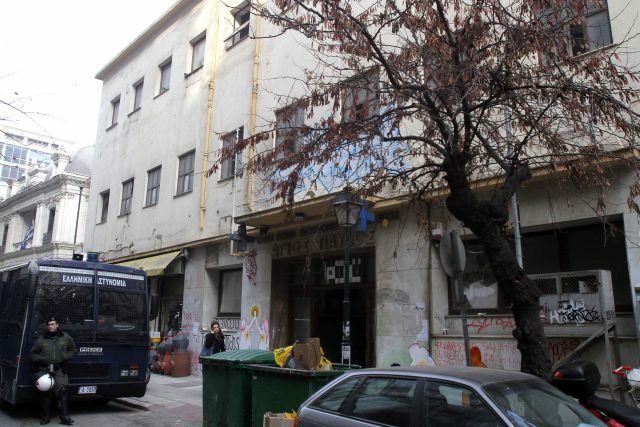 For two months, since October 2011, a building in the center of Thessaloniki owned by the French Catholic Church, which had been deserted for almost a decade, was squatted by over 40 homeless Greeks, immigrants and activists. 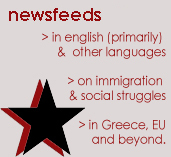 EPIVIOSI (=”Survival) was the first such experimental occupation in Greece: It was an open place with a general assembly, where anyone without shelter could fix themselves their own room and benefit from the construction workers’ collective in the squat, as well as enjoy common meals and language lessons. It was evicted, under pressure by the French State, on December 13th. On December 12, the general assembly of street vendors from Bangladesh, Pakistan, Senegal, Nigeria, Turkey and other countries entered Thessaloniki town hall during city’s council weekly meeting and addressed the mayor. One of them read out their text, demanding the city council end police attacks against street vendors and stating that they will not become scape goats for the crisis. AFTER years spent trying to build “Fortress Europe” to keep undocumented migrants out of the European Union, Brussels now wants to make it easier for immigrants to get in and boost the 27-member bloc’s economies. The European Commission is now proposing a new policy on migration and mobility which will benefit both sides of the immigration fence – the EU and the source countries. Cecilia Malmstrom, the EU’s home affairs commissioner, said migrants should be able to get visas faster, find jobs matching their skills more easily and send money to family members back home more cheaply. Her plan calls for closer cooperation with non-EU neighbouring countries, as well as those in Africa and the East, in order to attract more short-term students, researchers and business people and families. The EU needs immigrant workers to fill gaps of a shrinking workforce. Cracking open the EU’s door to legal immigration has been on Brussels’ table since 2005 when the commission unveiled plans to lure highly-skilled migrants to the 27-member bloc. In 2007, the commission warned the 27-member bloc will need millions of new workers to compensate for an ageing population. A common policy on migration will contribute to the EU’s economic growth and competitiveness, according to the Organisation for Economic Cooperation and Development (OECD). A 16-year-old boy from Syria, trying to enter Greece from Turkey, lost his life in a police pursuit in the border region of Evros on Thursday, December 1, 2011. The boy was found dead when the vehicle driven by a smuggler lost control and was overturned in the area of ​​Makri, Evros. 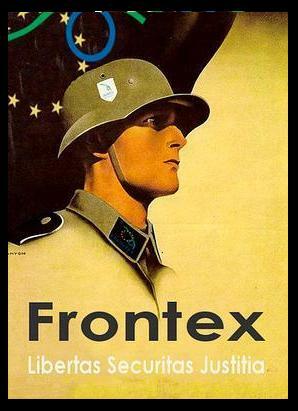 The incident happened when Greek border policemen and officials of FRONTEX tried to immobilize two vehicles carrying sans papiers immigrants, moving on Egnatia Odos towards the city of Komotini. The smugglers speeded up and managed to escape. After a while there was a second attempt by the police to stop the vehicles, at the Makri junction. One of the vehicles crashed, while the second managed to escape. In the vehicle, policemen found a 36-year-old smuggler, two injured immigrants and the dead 16-year-old boy from Syria.